I often get my inspiration about what to write here from others. Whether it’s from one of my readers or another blog post I’ve read on the net. In this case though, today’s blog post comes from a podcast I recently listened to. The podcast is called Do It Scared by Ruth Soukup and the particular episode I’m referring to is about limiting beliefs and How to Stop Listening to That Voice in Your Head That Says You Can’t. It’s all about how these limiting beliefs can hold us back and what to can do about it. It got me thinking about all the organizing limiting beliefs I’ve heard over they years that keep people stuck living in clutter and chaos. If you feel you are perpetually living in disorganization perhaps these organizing limiting beliefs are hindering any progress for change. So technically it’s not you, it’s just the voice in your head. Ha! Let’s figure out how to make it go away. So I took to the net again to figure this out and discovered that a limiting belief is a false belief that a person acquires as a result of making an incorrect conclusion about something in life. Self-limiting beliefs can also be excuses for a lack of willingness to change a behavior that inhibits your success. Ouch. In simpler terms, Ruth describes limiting beliefs as that voice in your head that says you CAN’T. It is a thought or belief we have that holds us back from achieving our full potential. 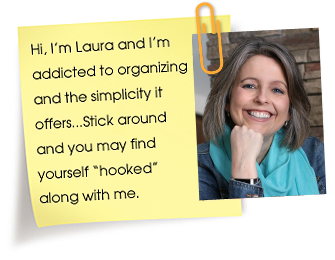 When it comes to organizing here are some of the limiting beliefs I’ve heard over the years. See if you identify with any of them. 1 – Name the fear. Identify the thought or belief that’s playing in your head, and figure out what exactly the fear is. 2 – Change the tape. Replace the message that your negative inner voice tells you with a new message, and intentionally craft a new script for yourself. 3 – Create accountability. It’s really hard to let people in and be real and authentic, especially when it comes to our limiting beliefs, but it’s important to have someone who will call you out when necessary. Let’s use one of the organizing limiting beliefs above as an example of how to use these strategies. Name the fear – the fear here is believing there is a right or wrong way to organize and that you might make a mistake. It can be quite paralyzing but when we name the fear and identify it we can also take away its power. Sometimes we aren’t even aware how much power we give these limiting beliefs. The truth is organizing is a skill that anyone can learn and thankfully there is no way to do it wrong. Yay! Change the tape – change your message to a more positive one…”organizing takes practice as with any other skill. Today I’m going to do one small thing to work towards my goal of not being disorganized. I am capable of doing this!” Repeat this to yourself over and over if necessary. We have to start changing the message that is being played, into something that is not so self-defeating. Another small message tweak can simply be “I have this great space in my home, how can I best use it to best organize my present life?”. Create accountability – If fear is standing in your way, you want to find someone to hold you accountable to change. Whether it’s a friend or family member or even a Professional Organizer (find one HERE in Canada or HERE in the US), be willing to receive honest feedback from them to keep you on track. Go over and have a listen of Ruth’s podcast for more in depth information on this topic and even get a free worksheet. The podcast isn’t specifically about organization but the theory can certainly be applied to this area if this is a struggle for you. It might just be the boost you need to push yourself out of your clutter and chaos rut and on to the other side. You’ve got this girl and yep you can totally do it!! Is Organizing Stressing You Out? 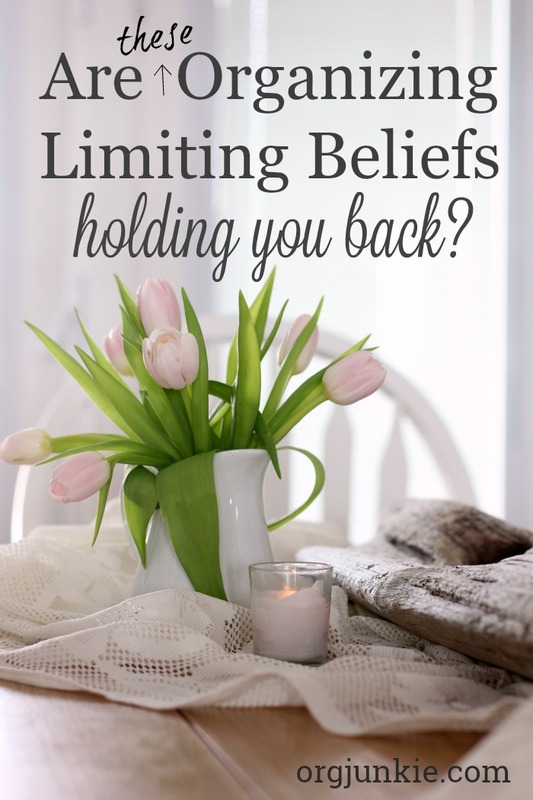 9 Responses to Are These Organizing Limiting Beliefs Holding You Back? I am overwhelmed by the amount of stuff I have. Thanks for commenting Nancy, I appreciate it! Stuff can be so overwhelming that is for sure because dealing with it requires making some tough decisions. If you start small by making only one or two decisions a day, it will be way less overwhelming for you. Good luck! I listen to Ruth’s podcast too! She is so motivating. I find time is my biggest self limiting belief. I always think, I’d love to get that area organized and cleaned out but I don’t have the time to do it right now. Usually I find once I’ve completed the task it never takes as long as I thought it would. I’ve even started timing how long certain things take so I can share with others that it really doesn’t take that long to do many organizing tasks. Timing tasks is such a good tip because that is almost always the case that we think something will take longer that is does. Thanks Leslie! Timing is definitely one of my biggest excuses. I read this yesterday, and today, I woke up 30 minutes early on my own. My bathroom has been collecting clutter, so I used that extra 30 minutes to corral everything, clean surfaces as needed, and to start to tackle the excess (face cream samples, scented body washes I don’t prefer, etc.). I had an extra grocery sack on hand, worked until I filled it, then proceeded with my day. Far better time spent than browsing the internet on my phone per usual. Thank you! Oh my that is so awesome Rhonda, way to go!!!! Small little bits at a time make such a huge difference in the long run without overwhelming us now. My biggest hurdle is a husband who resists organising and decluttering with all his might. I had a car full of things to take to the donation bin and he pulled everything back out and went through it all and put heaps back in the house. I am trying a more subtle technique now by removing things one at a time slowly so he doesn’t notice. It’s been 5 months and I have managed to tidy and organise the shed, the kitchen and our bedroom. Still piles and piles to go though. I forgot to add that I have heard him use every single one of the excuses on this list so this article resonates very clearly with me. I hope that by living in a less cluttered and more organised home, he realises that not everything needs to be held on to because everything runs smoothly and we actually have the money to buy those items I tossed that would have been kept for “just in case” but were usually expired or lost in the piles so had to buy again anyway.